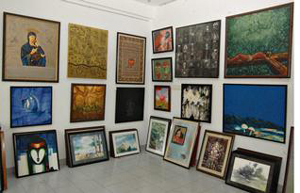 Mangaluru, April 01, 2015: Artist Vijayalakshmi B Sattigeri’s eight art works, along with Bavaradevi and M Badami, are on display at ’Kala Tarang’ exhibition of paintings at Prasad Art Gallery, organised with Department of Kannada & Culture. Vijayalakshmi has displayed acrylic works in abstract forms. She has followed a balanced approach in the portrayal of various shades. The techniques she has used include cut and paste, collage, colour balance and rhythm. Her ideas revolve around nature and its various components. Originally from Hubballi, Vijayalakshmi is presently lecturer at Bharathiya Kala Kendra serving for last 20 years. Speaking to the media, she said the current exhibition was her first in Mangaluru. Artists have too keep pace with changing trends in society and changing tastes of people. The search for new ideas will always make artist’s creative. It is important to strike a balance between tradition and modernity. Another artist Bavaradevi M Badami of Hubballi, has worked on acrylic on the theme women and nature. In her eight paintings one can find traditional decorative style of the portrayal of women with hypnotising charm, utmost grace and chiseled features. The art works express closeness of women with nature. Bavaradevi said she had tried to depict the charm of women in the best possible manners through these paintings. Her role as mother places her in distinctive position, along with establishing a relationship with nature. Bavaradevi M Badami is a lecturer at Government fine art College in Dharwad from the last ten years. Artist Suma Shet had chosen Lord Krishna as model for her paintings. The Lord with his divine flute, herd of cows and of course, Radha, gopis - milkmaid girls are seen in various forms and expressions. Graceful strokes are combined with modern touch. Suma Shet teaches at Vijay Mahathesh Lalithkala Maha Vidyalaya in Hubballi. The exhibition will conclude on April 1. It is open between 10 am and 7 pm.